I was driving into work last week, listening to the radio and minding my own business, when suddenly my world was flipped upside-down. Okay, that might be a little bit dramatic, but it sure felt like it at the time. The DJ on the radio had just announced that it was National Apple Pie Day. Right smack in the middle of May! I would have bet my bottom dollar that National Apple Pie Day would fall in the middle of October or something, but I would have been short one bottom dollar after that wager. According to the DJ, since apple pie is the quintessential American dessert, soldiers headed off to fight in World War II would say that they were fighting “for Mom and apple pie.” I’m having trouble finding a reason for choosing May 13th to honor the official dessert of the good ol’ USA, but who am I to question history? I would like to blame the fact that I’ve been thinking about apple pie for the better part of a week on a wacky pregnancy craving, but let’s be honest – baby or no baby, I still probably would have had a hard time shaking the apple pie dreams that have haunted my sleep. I was pretty set on belatedly honoring the holiday and whipping up a pie when I got home from work yesterday, but the more I thought about it, the harder it was to justify baking a pie in the middle of spring for Justin and myself. For whatever reason, I was able to justify baking some apple crumble. Don’t bother questioning it, there’s no logic to that reasoning. 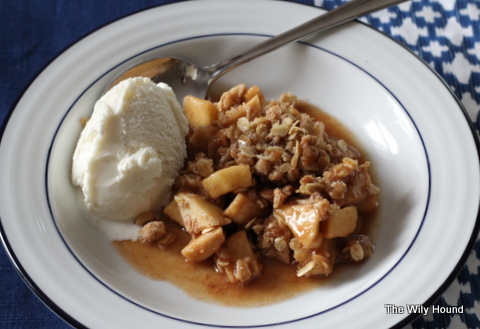 I used an old berry crisp recipe as a template and tweaked it a little bit so that it would work better with apples. A lot of this recipe is based on personal taste, so you can make adjustments as you see fit. 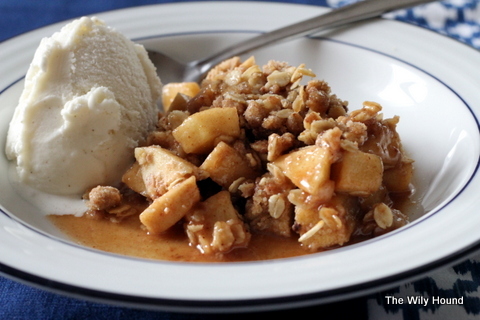 Like tender apples in your crumble? Use a softer variety like a Cortland. Not a huge fan of cinnamon? Cut it back to half a teaspoon in the apple mixture. I had 3 Granny Smith apples and 2 Fuji on hand and the flavor came out great. The Granny Smiths stayed pretty firm after baking and gave the crumble some texture, but again, it’s up to you! Preheat your oven to 375 degrees and grease a baking dish. 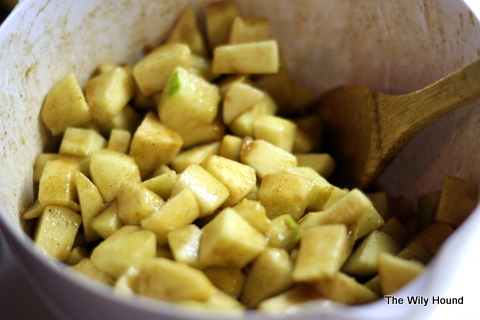 Toss all of the apple mixture ingredients to combine and pour the mixture into the baking dish. Combine the topping ingredients with a fork and sprinkle evenly over top of the apple mixture. Bake for 35-40 minutes or until the top is lightly browned. Serve warm or chilled, alone or with vanilla ice cream.